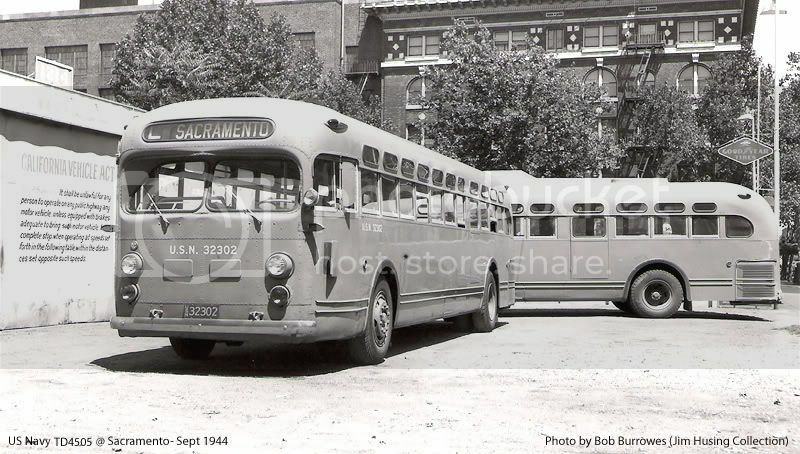 Pictured at Sacramento California in September of 1944 is fleet number 32302 - a 1942 Yellow Coach Model TD 4505 (hydraulic transmission) and one of three hundred and fifty numbered between 32201 and 35550 delivered through the United States Navy Purchasing Office in Washington, D.C. Many of these buses were originally destined for private operators such as both Eighth Avenue Coach Company and Surface Transportation System in New York but were diverted by the Office of Defense Transportation to various military assignments across the country. In this case, a number of these buses were stationed at the Navy's Mare Island Ship Yards in Vallejo, California (just north of San Francisco) to shuttle civilian workers to the base from the region. The Greyhound Corporation was contracted by the government to operate the Mare Island system and astute bus watchers will note that # 32302 carries accouterments that were normally to be found on Greyhound's own equipment including fog lamps and driver's search lights. The unusual set of protruding directional signals (one at each front corner) were designed to be seen from the rear as well as the front and it is unclear at to whether these buses had any type of directional device on the engine panels. The small round object over the right headlamp is a porcelainized Yellow Coach (YC) trademark.